Critically considering the federal government’s presentation through the Agric Minister which was referred to as The Fulani Cattle Colony being proposed by President Muhammadu Buhari, it could be compared to what the British government created to enslave people from this region. To us here in Nigeria, a colony is nothing new. The colony of Lagos established by the British in 1861 has familiarised us to it. A colony is a place for the settlement of people “with common or similar language, interests or occupations, living together in close association”, like the farm settlements established in some parts of the Eastern Region of South-East Nigeria by the Government of M.I. Okpara. A colony as a settlement for people is one integrated idea, it cannot be separated from a settlement; it cannot meaningfully exist divorced from such a settlement, except as a mere idea without existential content. So divorced, it means nothing but an empty word tendentiously employed to beguile or hoodwink the public. The cattle colonies which the Federal Government proposes to establish in every State of the Federation can, therefore, mean nothing other than a place for the settlement of Fulani herdsmen, however much the Federal Government may try to hide this fact, by, for example, calling it “cattle colony”; that is what it is intended to be, and will eventually become, if it is not such from inception. Its character as a place for the settlement of Fulani herdsmen is implicit in the Agric Minister’s long presentation giving details of the proposed project, as published in the Nigerian Tribune newspaper of 12 January, 2018, which leaves him no room to gainsay it. It is not the idea that cattle is to be left in a colony without a herder or keeper, without someone to feed it, give it water, and keep a watchful and protective eye on it. Rearing cattle or livestock necessarily requires a herder. From what we know, two or more herders will be needed to follow and tend 100 cows; accordingly, 300 herders will be needed to tend 30,000 cows. A colony of 30,000 cows requires 300 herders living in the colony. It may be expected that a herder may have a family, a wife (wives) and children living with him in the colony. We are therefore talking of 300 Fulani herdsmen and their families lodged in the body of a State under the scheme. 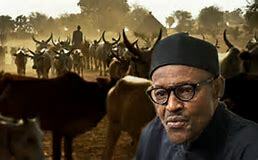 It is clear that Cattle Colony is a proposal to re-colonise all the regions in Nigeria using the Fulani Herdsmen technique and defended by the sitting Fulani President of Nigeria.